In the collectibles world, figures are not considered “toys” as much as they are a further extension of the art they were inspired by. There’s a creative expression to translating a character from an artbook or an anime into a memorable collectible, and companies such as Alter, and Good Smile Company take the challenge to heart by producing top notch figures with great attention to detail and design. One of the most well-known figurine makers in Japan is Kotobukiya, who have been in the business of making high quality model kits and figurines for more than 60 years. The company has catered to the desires of many different types of collectors, including licensed Mobile Suit Zeta Gundam The-O mecha model kits. “More so in Japan than the US, model building appeals to a wide age range of individuals and is not solely limited to adolescents,” said Dan Lujan, Kotobukiya's director of media operations. For a fan, there’s often a thrill to owning merchandise related to a thing they love and enjoy. For instance, fans of a very popular show like “Evangelion” love owning figures of the characters in both old and new interpretations. Even though the show itself is 16 years old, collectibles of the characters still sell very well. For collectors, owning a figure is a bit like owning a small part of a manga or anime series they loved, and it can bring a smile to one’s face to see that same figure on their desk every day, as it evokes memories of when the collector learned to care about the character. Collectible figure communities such as My Figure Collection and Plastikitty also provide a forum for fans of the hobby to meet, interact, and trade, adding a social aspect and providing an excellent space for fans to simply bond and enjoy the most joyful part of figure collecting: squeeing over a rare acquisition! Since Japanese collectibles are often manufactured in limited runs, there’s a race to reserve your spot for one or a hunt involved in finding one that’s out of production. Collectors of just about anything can relate to the endorphin rush of a treasure hunt, and the excitement involved when you acquire just what you’re looking for. In recent years, figure collectors have also discovered a new dimension to their hobby: photographing their collectibles. With the right backdrop, setting, or camera angle, a plastic sculpture can be portrayed in a way that brings it to life and shows off the true beauty, as the sculptor intended. Healthy communities have spring up around this as well, and you can share your photos of your collection many online sites, as well as comment on the work of others. Kotobukia’s ARTFX lines feature flexibility in display which opens the possibilities for staging photographs of figurines. “Many of our releases include multiple parts such as alternative heads, arms, and weapons. Collectors can choose the pose or style that best fits their current mood and can alter that within seconds to an entirely new look and feel. We have a variety of movie and comic licenses under our ARTFX banner including Star Wars, Marvel, and DC Comics. For gamers we recently signed on mega publisher Electronic Arts and will be offering statues from the immensely popular "Mass Effect" and "Dead Space" videogame franchises,” Lujan said. In 2009, Kotobukiya formed a US team to bring its products to the fans here. Iconic characters from the Marvel universe have proven to be popular figurines with US fans. Bishoujo cleverly blends anime sensibilities with comic icons for a fresh result that's capturing the hearts (and wallets!) of collectors everywhere. The concept art for the Bishoujo line is all done by Japanese artist Shunya Yamashita. The art style of Yamashita-san’s drawings are often playful, said Lujan, and beckon the days of the American pin-up model. 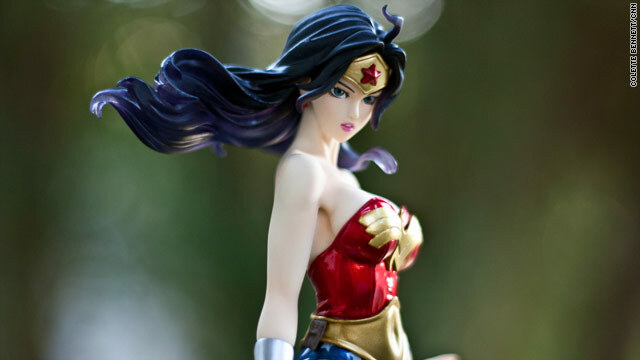 “This fusion of Eastern and Western aesthetics transfers superbly well to these comic heroines (and villains) and provides consumers with something unique that really stands out in the marketplace of licensed, collectable merchandise,” he said.